When the world is more divided than ever, with hatred and progression at endless war with one another, climate change rapidly altering the very course of our existence, and with stories about terrorism and economic woes dominating the news, sometimes the best antidote is a good old-fashioned slasher movie. As odd as it may sound, the time-old horror tradition of a small group of characters – mostly teens or young people – getting bumped off by a (usually) masked serial killer in many gruesome ways can make for such wholesome entertainment that, like the very best of escapism films, all your worries in the real world are instantly forgotten as you see how much worse your situation could be; sure, you have to deal with Brexit and Trump amongst other things, but at least you’re not being stalked by someone who will not stop until you’re mincemeat. It is up to you to decide which situation you’d rather be in, but regardless you now have a pretty fun and entertaining slasher film in the form of Hell Fest, which goes for broke with bloody kills and endless Halloween-themed scares, and mercifully doesn’t pretend to be anything more than it really is, making it a refreshingly unpretentious and extremely enjoyable mindless slasher film in this day and age. The story is very easy to follow, and therefore easy to explain; a group of young people decide to spend the night at Hell Fest, a travelling horror theme park with all sorts of spooky attractions including haunted houses and actors who come up and scare you in the park, but their night is rudely interrupted by a masked killer who has decided to make them his latest target, and although it takes a while for his murderous spree to become noticed amidst all the other horror-themed amusements going on around them, it’s not too long after that they must try and survive the night. That’s exactly what this movie is, and it delivers on that simple, non-convoluted plot with no major twists – the killer is established early on as someone entirely separate, so there are no late twists such as how the killer was one of the friends this whole time – and no long-winded explanations about why the killer is doing everything he does; it really is as simple as “a guy wants to kill people”, and that’s it. Some will complain about how this film doesn’t add anything new to the slasher film genre, which is a fair point to make, but sometimes we don’t want something that’s setting out to change the game. Instead, we just want a formula that’s been known to work in the past that happens to be done well and in an entertaining and fun manner that any fan of the slasher movie can enjoy. Hell Fest is that formula through and through, with all sorts of characters you’re used to seeing in slasher films such as the sensible main girl, the horny friend, the potential boyfriend and so on, but it’s executed in a way that ensures you’re having as much fun as the people you’re experiencing everything with, and these actors have good chemistry with each other and individually do a fine job at being likeable enough to make you not want to see them all get killed. When the time comes for one of them to inevitably be killed, however, you’re suddenly filled with sadistic glee because it means that there’s a fun death scene just around the corner, and boy are there some pretty gruesome kills in this film. One of the great things about this wildly inventive idea – that of a serial killer being set loose in a horror-themed theme park – is that there are so many opportunities for mere fairground attractions to suddenly be transformed into the deadliest weapon a killer like this can find, like a test of strength machine or one of the many items found in this park’s numerous haunted houses, and director Gregory Plotkin doesn’t shy away from showing the vibrant gore resulting from their use, giving the audience some very creative death scenes that are as fun as the theme park it’s all taking place in. Speaking of the park, this idea also lets the filmmakers go all out in creating the most insane environment that’s both incredibly suspenseful and tons of fun. To channel my inner Stefon from Saturday Night Live, this place has everything: masked demons, rotting corpses, Tony Todd dressed as a mix between Willy Wonka and if Tim Burton directed The Greatest Showman; the list goes on. They’ve put so much time and effort into making this theme park so vibrant and interactive that you’re somewhat disappointed that this was all just for a film and not for people to actually go to in real life, but the movie at the very least uses it to its fullest extent with its numerous death scenes and overall spooky attitude. But seriously, can Hell Fest be a real place around Halloween just as Winter Wonderland in Hyde Park is around Christmas, because masked killer aside I kind of want to actually go to this place as it looks like a hell of a lot of fun (pun very much intended). For now, though, we’ll have to make do with the fact that this exciting theme park is just on the big screen, and luckily not a second is wasted in making this as fun and enjoyable a slasher film as you could possibly imagine, with some gruesome death scenes, a creepy killer (whose look isn’t the most original, but it’s a haunting enough mask to tide you over), some likeable lead characters you don’t exactly want to see get bumped off, and an old-fashioned sense of bloody fun that we sadly don’t get to see a lot of in most slasher films nowadays. 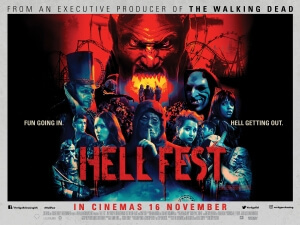 If you’re up for a fun horror movie to just put on and relax to with your friends, then Hell Fest is an attraction you should immediately start queuing for. Hell Fest is a delightfully old-fashioned slasher movie that makes great use of its inventive setting to give us some fun and gruesome kills, and overall give the audience an entertaining time that they’ll want to queue up for again and again.